Brandon Chamber of Commerce | Belong to Win! Scroll down to see what we’re giving away in our prize giveaways! Belong to Win at the Brandon Chamber of Commerce! 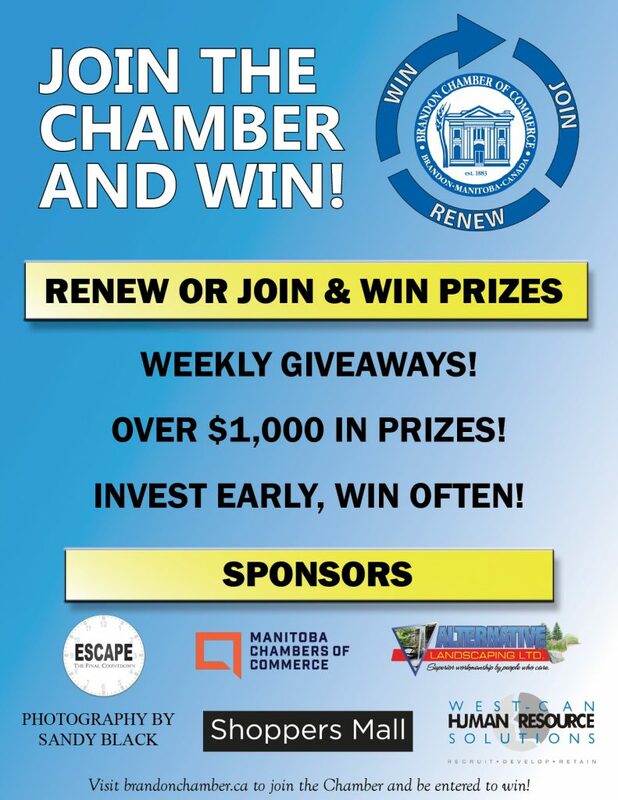 We’re heading into a new year with the Chamber on June 1st, and what better way to say thanks for being a member than to give away some awesome prizes, just for being a member! This year we’re giving away a prize every Friday starting June 15th until we run out of prizes to give. Entering is easy, all you need to do is either renew (You can pay online!) or join as a new member and you will be automatically entered to win (upon receipt of payment). The earlier you join or renew, the more chances you will have to be entered into our prize draws! It pays to pay promptly! Click Here to sign up online, or email us at members@brandonchamber.ca. Make sure everybody knows your name (or at least your business!) with our Marketing Package, featuring $500 in Chamber Dollars (available for use in any of our advertising options), as well as 15% off services at Photography by Sandy Black. Learn to work with your team a little better with an outing to Escape! The Final Countdown, where you can use the $100 in gift cards towards an Escape Room experience! Sometimes writing that perfect job description for next potential employee can be a bit of a hassle, especially if you don’t have the time to commit to it. Luckily, with a $100 gift card from West-Cam HR Solutions, you may not have to! Specializing in a large variety of services, West-Can HR Solutions ensures that your next employee is the right one. Ready for the Football season? Enjoy a game with the Winnipeg Blue Bombers with a friend, courtesy of the Manitoba Chambers of Commerce, as they go head to head against the Saskatchewan Roughriders on October 13th! Some of us can’t take care of a cactus, let alone our landscaping around our businesses. Thankfully, with the help of member companies like Alternative Landscaping Ltd., we don’t have to! The Landscaping Package will feature a special plant prize to be featured in your place of business, as well as a gift card to be put towards beautifying your space! Sponsored by Alternative Landscaping Ltd.
Networking isn’t just about making sales, it’s also about making connections that will help you support your business and be involved in your local community. The Chamber recognizes this, which is why we put together 4 free tickets for our upcoming Luncheon Series, starting in September 2019, valued at $140! Wrap up your Summer with a gift card from Shoppers Mall, to be used in over 90 stores, where there is definitely something for everyone! A special thanks goes out to all of our sponsors who made it possible to give away all of these awesome prizes!